The Navarro County Courthouse in Corsicana, Texas is a beautiful historic building originally constructed in the early 1900s. 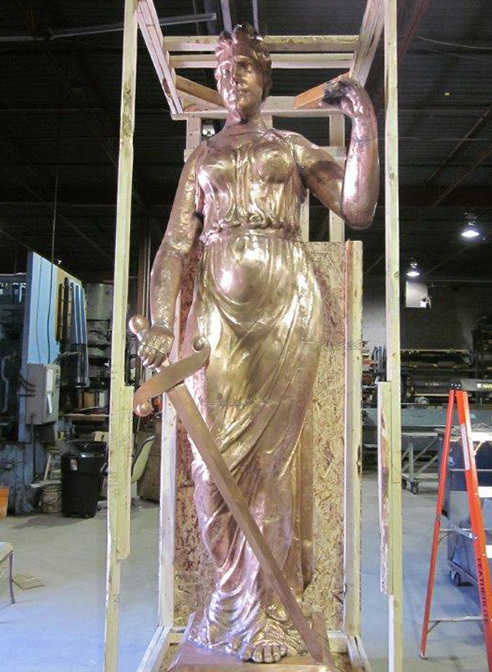 In the 1940s, it was found that the copper Lady of Justice statue atop the courthouse was in need of repair. It was then removed to be restored, and never seen again. 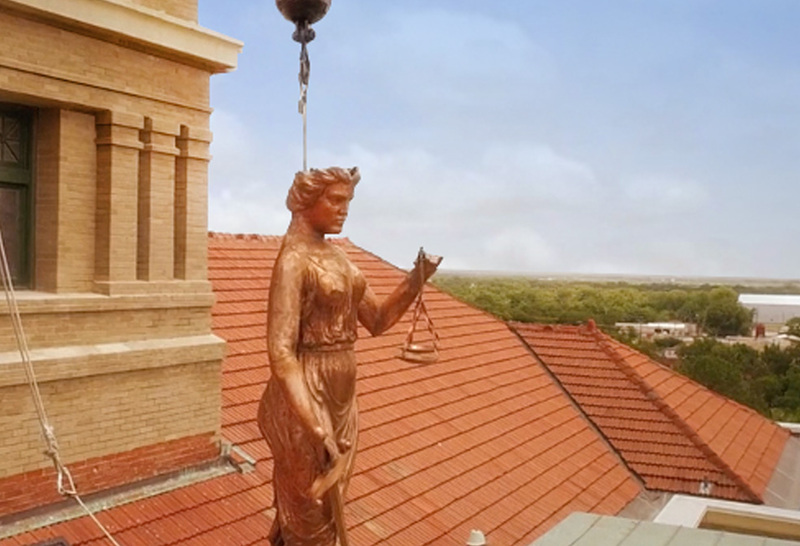 Without this original Themis, the community felt that a large piece of the court house’s history was missing. With the goal of restoring the courthouse to be used for its original purpose, major restoration work began on not only the statue, but the rest of the building as well. Heather & Little partnered with Phoenix 1 Restoration of Farmers Branch Texas in collaboration with the Texas Historical Commission and ARCHITEXAS the preservation-based architecture firm to restore the building and its unique statuary to their original state. 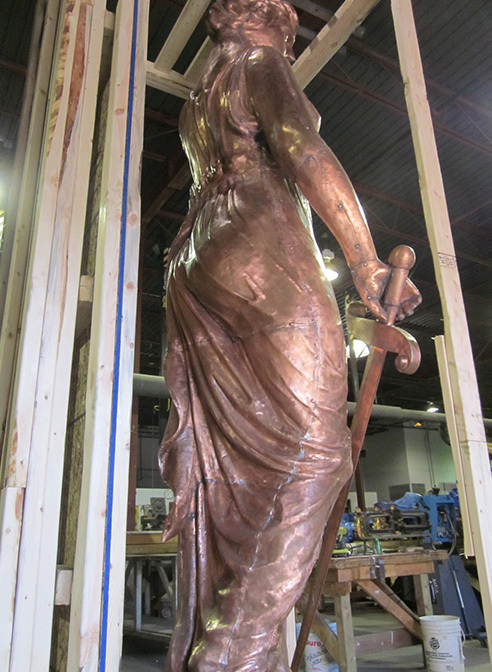 Our team has successfully restored and reproduced Lady of Justice sheet metal statues for courthouses throughout the United States, and for this project. With the help of the Texas Historical Commission, a grainy old black and white photograph, our artisans carefully studied archived photo to emulate the position of the statue’s head, hair style, and position of the arm holding the scales to more accurately capture the original statue. We also performed restoration work on the copper cresting crowning the copper dome located at the top of this historic building using 24-ounce sheet copper to fabricate these decorative elements and complete the restoration of the court house. 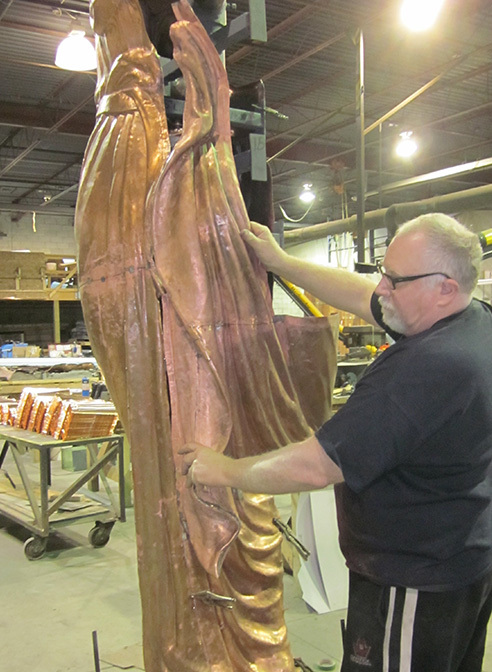 To learn more about this copper statue restoration project, browse the photos below, or watch our video.